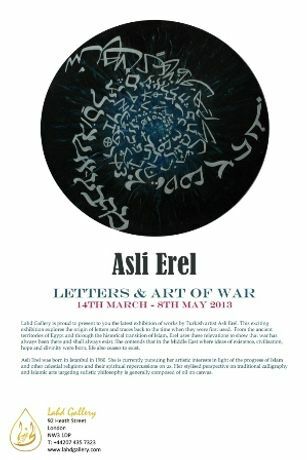 Lahd Gallery is proud to present to you the latest exhibition of works by Turkish artist Asli Erel. This exciting exhibition explores the origin of letters and traces back to the time when the first utilisation of them was witnessed in the alphabets of the semitic languages. From the ancient territories of Egypt and through the historical transition of Islam, it looks at how or if the inclusivity of all religions have illuminated or culminated in this transition. Erel uses these relevations to show that war has always been there and shall always exist. She further argues that as long as the human nature struggles and fights with itself, people are doomed to fight against others. In the Middle East where ideas of existence, civilisation, hope and divinity were born, life also ceases to exist. Asli Erel was born in Istanbul in 1980. She is currently pursuing her artistic interests in light of the progress of Islam and other celestial religions and their spiritual repercussions on us. Her stylised perspective on traditional calligraphy and Islamic arts targeting sufistic philosophy is generally composed of oil on canvas.